This aerial image shows the three buildings on Flax Street the city wants repaired, with the line showing the property boundaries. A property owner has until the end of the year to make upgrades to three buildings at 15 Flax St., the city of Delaware’s Board of Zoning Appeals ruled Wednesday. If the upgrades are not completed, the BZA may ask the city to condemn and demolish the buildings at its meeting on Jan. 13, 2016. In its unanimous vote, the board said the property owner would not be granted any further extensions to make the upgrades. 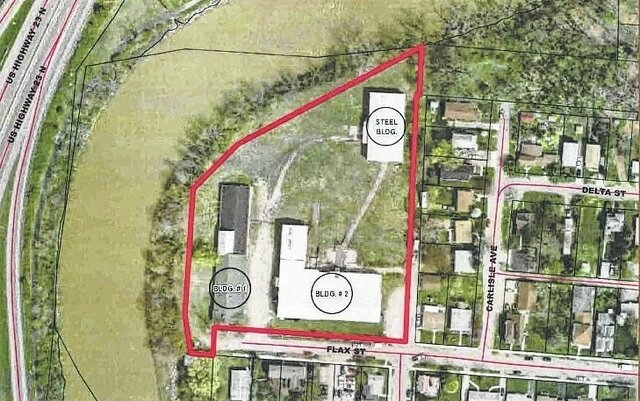 The three buildings sit on 3.61 acres on the north side of Flax northwest of Milo Street and near the river. It is zoned as a light manufacturing district. City staff said the buildings are old and were once a factory, but had been vacant for years. The property has 15 violations of the 2000 International Property Maintenance Code, the staff report said. The BZA had originally considered the case in March, but attorney David Gordon, representing the Los Angeles-based owners, Yoav and Schlomo Botach, asked for it to be tabled. The case was again tabled to allow for further inspection of the buildings. City staff then recommended allowing for the extension to make the upgrades to the property. BZA member Robert Badger said he had gone to the property prior to the meeting and noticed that while there had been some lawn mowing and shrub trimming, the site hadn’t been cleaned up. Behzad Vedaie, a Columbus-based engineer who represents the owners, said that the people cutting the grass were chased off the property. He also said that a contractor who was going to make repairs went out of town on another job. James Mardis, who said he owns the land next to the river, said the grass cutters were removing the shrubs on his property, and he had threatened to call the police. He also said he felt the buildings should be demolished. Badger said he hadn’t seen any work being done at the site, and wondered if the project could be completed in time.